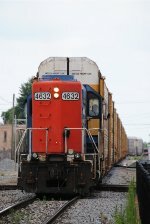 Title: GTW 4632 on CN 280!! Description: Now THIS is something you don't see everyday anymore. Grand Trunk 4632 leads CN train 280 past the Amtrak station, by itself. Nathan M3H Blaring. When was the last time you saw a GP9 pulling a mainline train like this???????? Description: Still going strong (well, kinda) after all these years. Description: Crossing Ash Street, GTW 4632 leads Train 246 south at Milepost 24. Description: R930 heads past the diamond for headroom. Description: Sweet little Grand Trunk Western GP9 working for the CN.